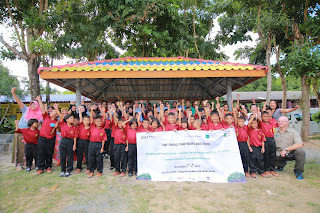 Students of Bang Kang Kao School thank GNF and partners for their visit. 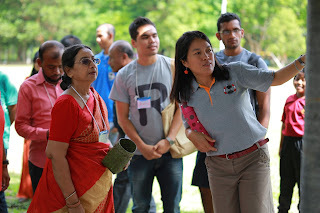 Between 2-6 November 2015, was a great opportunity for the Mangrove Action Project (MAP)-Asia to organize the final partners’ meeting and host twelve international participants who were involved in the Federal Ministry of Economic Cooperation and Development (BMZ) funded project in Trang and Krabi provinces, southern Thailand. There were representatives from EMACE Foundation and Nagenahiru Foundation from Sri Lanka, The Center for Research on New Economic Order (CReNIEO) from India, The Fisheries Action Coalition Team (FACT) from Cambodia and the project holder Global Nature Fund (GNF) from Germany. 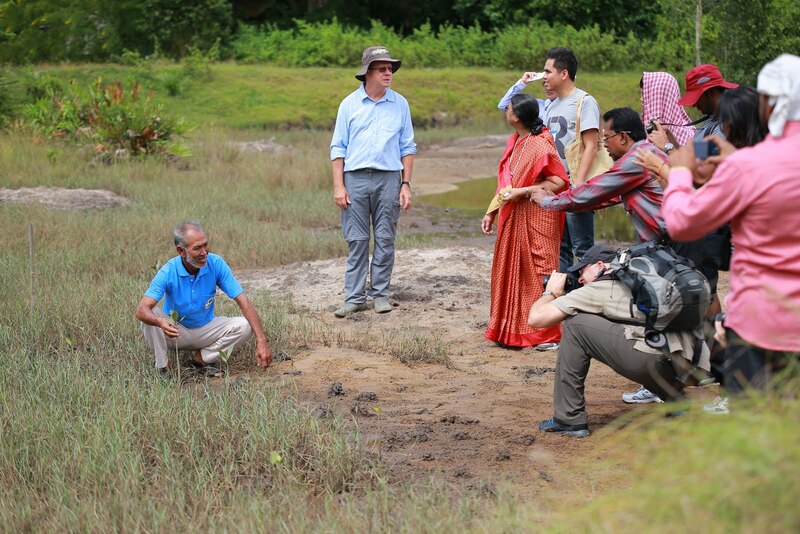 MAP has been a part of the four year project “Mangrove restoration in Asia – local action and cross-border knowledge transfer for climate, forest and biodiversity conservation” which was coordinated by the Global Nature Fund. Under this project MAP focused on mangrove restoration utilizing the Community-based Ecological Mangrove Restoration (CBEMR) method. The mangrove restoration was implemented in five communities in Trang, Krabi and Phang Nga provinces. explains CBEMR site restoration process. On 3-4 November the participants spent two full days at the Eco-Inn Hotel in Trang town in a friendly atmosphere presenting and sharing experiences, lessons and achievement from the previous four years. 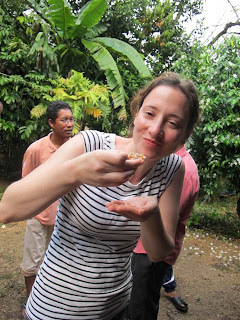 On the following day a field trip was arranged which allowed all participants to gain more understanding of CBEMR as well as to experience a real taste of snacks from mangrove forest from the villagers in Bang Khang Khao (BKK) community. A very warm welcome event was hosted by BKK school students with a traditional dance before everyone viewed the project supported mangrove interpretation sign-boards and the children’s environmental paintings on the walls inside and outside the school bathrooms. at Nai Nung village, Krabi. 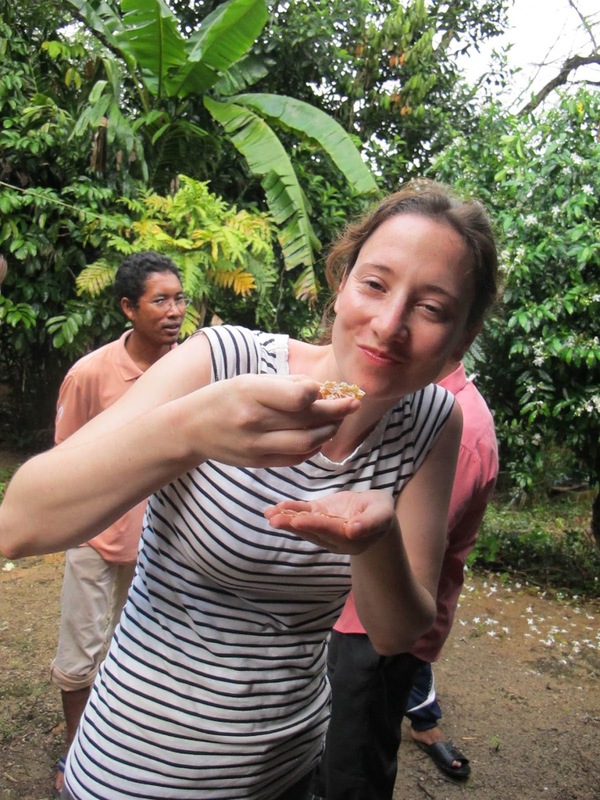 On 6 November, the last day of the field trip the MAP team led everyone to visit Klang Island in the Krabi River Estuary where they visited the Klonglu homestay group, the youngest site under the BMZ-GNF project. A productive discussion was organized chaired by an official from the sub-district Administrative Office and attended by representatives of local project partners the Department of Non formal and In-formal Education which has a centre at the Klonglu Homestay as well as the local community homestay operators. The final meeting of GNF ended with a discussion among partners giving feedback and sharing the future perspectives. All partners agreed that we have all learned a great deal from the last four years and should continue this network. The field course was a great opportunity for MAP to disseminate the CBEMR methodology and showcase several of the restoration sites to all the partners.